Finance, like other forms of human behaviour, underwent a change in the twentieth century, a shift equivalent to the emergence of modernism in the arts - a break with common sense, a turn towards self-referentiality and abstraction and notions that couldn't be explained in workaday English. This is a quotation from John Lanchester's new book Whoops! about the crisis of capital as used in a review in this week's Times Literary Supplement. Perhaps it makes sense to a financier but it makes no sense to anyone with a feeling for Modernism, the revivification of art following the petrification of Romanticism; a petrification exemplified in literature by the Victorian ideal still idolised by contemporary commerical writers. Lanchester's makes more sense as a defintion of what Modernism is not. How about the notion of art as the search for truth at any cost? Workaday enough for you? Following last Sunday's post, this is another small example of the abiding complacency at the heart of English literary culture. John Lanchester is a Contributing Editor of the London Review of Books. might he not have become – at the very least – a German version of Thomas Bernhard, a refusenik, an internal exile, his solipsism not modulated by melancholy but intensified until it became a cachinnating cynicism? Instead, Sebald’s writing is anecdotal in feel, and furnished with plenty of English quotidiana – Teasmades and coal fires, battered cod and dotty prep schoolmasters, branch line rail journeys and model-making enthusiasts; enough, at any rate, to submerge any disquieting philosophizing. Sebald had no need of a Holocaust Remembrance Day – and I believe that if we read him rightly nor have we English. In Germany a Memorial Day for the Victims of National Socialism is indeed an appropriate response – if not an atonement – for crimes committed, but here Tony Blair might have done better to inaugurate a Refusal to Grant Refugee Jews Asylum Memorial Day, or an Incendiary Bombing of German Cities Memorial Day, or even – casting the shadow forward – an Iraqi Civilians Memorial Day, for these are deaths that more properly belong at our door. For Sebald and for those of us who hearken to his work, there is no need to remember, because the Nazis’ Holocaust is still happening in an interlocking space, while before us are the poisoned seas, the glowing piles and the cold putrefaction of an environmental one. Amis: People assume that it’s the gloomy buggers that are the serious ones — but in fact, anyone who has ever been anywhere in fiction is funny. Yet there are whole reputations built on not being funny. Who’s that German writer doesn’t even have paragraph breaks? Tom Chatfield: I don’t know him, I don’t tend to read that kind of German writer. Steven Poole was the first to point out that "Amis might have been thinking of the Austrian writer Thomas Bernhard, who in my opinion is extremely funny". Are there any other writers in German who don't use paragraph breaks? Perhaps Amis is being funny himself; after all, who ever gets pleasure from paragraph breaks ("Hit return, baby, one more time")? My own bewilderment at comments like this – another one would be Jonathan Jones' dismissal of Saul Bellow in favour of a much lesser writer – suggest that Will Self is right to raise the biographical influence on Sebald's fiction. I wonder if this could be the reason why Amis' novels leave me cold, books written by a stranger in a strange land. I have to say the same of Will Self's novels and those by almost every other big name in current English fiction, whereas Sebald and Bernhard and so many other European novelists give me the air in which to live and breathe. Perhaps it's something to do with internal and external exile. High modernism in English is peopled by exiles and aliens: Conrad, Eliot, Joyce, DH Lawrence and Woolf in their own ways, while contemporary writers whose novels have moved me also tend not to be inward with the culture in which they live and work: Sebald himself, Hugo Wilcken, Tao Lin, Jonathan Littell, Agota Kristof, JM Coetzee, Aharon Appelfeld. Of course it doesn't hold entirely and, Colin Wilson-like, one can overplay Outsider art, but what it does offer is an initial diagnosis of the long-term malaise in English fiction. Whereas Sebald and Bernhard expose their fellow countrymen to the taint, Martin Amis and Ian McEwan seem happier to criticise the official enemy than the genocide being perpetrated in their name by young Christian white men (it's not just Amis displaying "­narcissism and [an] inability to empathise"). What is to be done? I'm not implying that English fiction needs to address this subject as such but, to quote another writer not of his land, to find words for what would otherwise remain wordless. Reading David Shields’ new book – but in what way is it a book? – is a frustrating experience. As demonstrated by the previous sentence, on almost every page of Reality Hunger the reader is interrupted by responses, doubts and questions. "Every artistic movement from the beginning of time" it begins, "is an attempt to figure out a way to smuggle more of what the artist thinks is reality into the work of art." Why, one asks, half-aware of the question because one is trying to get into the book, does he use "artistic movement" rather than "artist"? The answer is soon clear: he is seeking to galvanise a new artistic movement by expressing his own concern with the relation of art to reality. It has an impact on the form and content of the book, so much so that it fails to become a book yet, as a consequence, ends up enacting part of Shields’ manifesto. However, what remains betrays it. Reality Hunger's immediate resort to journalistic cliché establishes a workman-like, commonsense approach to its subject. It not so much smuggles reality as coshes writing over the head and replaces the body with a waxwork doll. And it doesn't stop. Why does he use the empty phrase "beginning of time" when it's more appropriate, realistic alternative is the "beginning of art" – so that we immediately think of, say, the caves of Lascaux? Cave art is of course a beginning separate from any "artistic movement" or even any notion of art and surely would be Shields' ideal. Yet it goes unmentioned. The absence of art known to those cave people and then obliterated by the paintings is like the absence of time in that it erases the conditions in which one is able to talk about it (or even talk fullstop), thereby implicating any reflection on art's supplementary character, the character of which is Shields' subject. Moreover, to raise the opposition of art and reality immediately raises the question of what both art and reality are in themselves. Reality Hunger does present ancient literary references: Homer, Thucydides, the New Testament, yet few rate more than a paragraph's attention. Entry 23 provides the following insight: "The Tale of Genji: an eleventh-century Japanese text about court life." This is on the level of Woody Allen's speed reading of War & Peace. Cave art would be a good starting point. Perhaps though it is a poor example because its production in the want of natural light, its exertion of ritual pressure and its generation of the intense vertigo of time, is not the kind of reality Shields hungers for. He is keen on the notion that art has "retreated .. from the representational into the abstract", which would mean emerging from the caves into the light of day, away from art. To descend back, however, and, by the flickering light of burning torches, to witness the forms on the cave walls, reveals the poverty of such an opposition. If the caves reveal that art's presence enabled humanity to discover its unique power over life and death, a fundamental question is begged: in what way is a work of art distinct from human reality? If the work of art is itself part of the world, an addition inseparable from phenomena, then the idea of smuggling is not only bafflingly superfluous but counterproductive. Shields’ smuggled art would then be reality disguised as reality. Without this illusion, the task left for the artist/viewer is to have a relation to art that is distinct from his or her relation to reality. It would not be enough to claim membership of an "artistic movement". My intent is to write an ars poetica for a burgeoning group of interrelated … artists in a multitude of forms and media … who are breaking larger and larger chunks of 'reality' into their work. The Corrections: I’d say: I couldn't read that book if my life depended on it. It might be a "good" novel or it might be a "bad" novel, but something has happened to my imagination, which can no longer yield to the earnest embrace of novelistic form. Perhaps we need to start again, again. Shields' key components for his new artistic movement include: "deliberate unartiness: 'raw' material, seemingly unprocessed, unfiltered, uncensored, and unprofessional." He wants to encourage: "Randomness, openness to accident and serendipity, spontaneity; artistic risk, emotional urgency and intensity, reader/viewer participation; an overly literal tone". He doesn't provide immediate examples except to add, in parentheses: "(What, in the last half century, has been more influential than Abraham Zapruder’s Super-8 film of the Kennedy assassination?)". Influential to whom and to what artistic end? American culture perhaps, yet there is nothing deliberate about this film, nothing "seeming" to efface: it is definitively unprocessed, unfiltered, uncensored, and unprofessional. The assassination itself could be said to be as equally influential in the same parochial sense. In itself, skull bone and brain matter flying across the boot of a car has nothing to do with art unless we recognise that reality is borne on human agency: that is, the influential aspect of the assassination is not its reality – which perhaps only JFK could said to have experienced (though the meaning of experience would then be under question) – but its distance from our grasp. Inherent, necessary distance would explain the looping repetition of the Zapruder film across these 47 years. In brutal contrast, the innumerable angles in the coverage of the 9/11 attacks still do not lessen our distance or tighten our grasp: the distance remains as fascinating as ever. Something happens to our imagination as we witness everything from art to atrocity: we recognise distance. No amount of 'raw' material makes any difference except, perhaps, to delude the consumer of the latest angle of attack. The critic, of course, should be the first not succumb to such delusion. Two sorts and, by now, we know which we're meant to favour. Yet both respond only to distance. To ask what life is in itself is already to open an abyss. It's not a question that troubles this book because it knows that life is what is "actually occurring in the world" independent of the viewer. To achieve all Shields' favoured elements then one must discharge agency, which is strictly impossible for the artist; discharging is agency by stealth. So what Shields wants instead is for the artist to efface agency, risk nothing but being found out. His undue focus on the James Frey controversy – innumerable entries are dedicated to this singularly American phenomenon – reiterates the inconvenience of the question: "I'm disappointed not that Frey is a liar but that he isn't a better one." The secret or mystery of art which Reality Hunger cannot resolve without denial goes back to its keenness on the false opposition of representation and abstraction. One of its most curious blindspots is a persistent misrepresentation of modernist fiction - that "retreat .. from the representational into the abstract" again. Entry 14, apparently quoting a conversation with Jonathan Raban, claims Henry James is responsible "for much of the modernist purifying of the novel's mongrel tradition." I see writers like Naipaul and Sebald making a necessary post-modernist return to the roots of the novel as an essentially Creole form, in which ‘non-fiction’ material is ordered, shaped, and imagined as ‘fiction. Books like these restore the novelty of the novel, with its ambiguous straddling of verifiable and imaginary facts, and restore the sense of readerly danger that one enjoys reading Moll Flanders or Clarissa or Tom Jones or Vanity Fair – that tightrope walk along the margin between the newspaper report and the poetic vision. Much of Reality Hunger's unwitting conservative nostalgia is condensed in the whiny repetition of "return" and "restore"; one can sense the regret and the wish to get back to a golden age when readers and writers flourished in a literary garden of Eden untroubled by the beasts of Lascaux. Yet how do the four exemplars of literary modernism, which describe all aspects of life and more, and which contain all kinds of risk – Joyce's Ulysses, Proust's In Search of Lost Time, Kafka's The Trial and, more recently, Beckett's Trilogy – present as acts of purification? Perhaps it is precisely the and more that is objectionable; each approaches areas we can't quite call reality. It is particularly revealing that the conversation with Raban identifies a "newspaper report" as an ideal for a writer of fiction. Shields is the son of journalists and it informs his literary values and assumptions. Entry 66 quotes Rachel Donadio: "Today the most compelling energies seem directed at nonfiction". A statement one would never expect from a journalist on the New York Times. The purest form in modern literature is surely that of genre, which by definition prepackages reality. By no coincidence, the feature fiction review in the January 21st edition of the TLS is a long article arguing that "the crime novel and the thriller have a more direct power than their literary cousin to depict a society’s ills". It's no coincidence because every month similar articles appear in the popular press, such is the sublimated urge to mitigate or disguise the purity of craft. But of course criticising genre is a literary faux pas of the first order. Best to stick to blaming the most radical artists who have no "artistic movement" to protect them. It's not that purity of form and control over material isn't a strong feature in most of the great modernist novels: despite Marcel's fascination with them as he imagines returning to his love interest in Balbec on the Normandy coast, Proust does not – as one expects Shields would hope – reprint actual train timetables. Instead, In Search of Lost Time introduces reality by arranging for its absence to be long forgotten and then experienced again in habit-shattering fashion. This is why the novel is over three thousand pages long. The novel moves through literature rather than evades or effaces it. It moves toward what habit enables us to forget in order to know it again as if for the first time. In many ways Proust embodies everything Shields calls for, only, rather than features, attention to randomness, accident and serendipity are the gears turning at the centre of Proust's work. In Proust, for example, who is to me at base an essayist, nothing ever happens. The only obstacles are that someone might rebuff someone else or someone might get sick or grow old, and even these are usually hypothetical obstacles. People get educations, travel, buy paintings, go on diplomatic missions, but the events are for the most part meetings between various people (or simply sightings of one person by another, sometimes thanks to a stroll or a ride in a carriage) and what these meetings bring out, on a psychological level, about life itself. How can a work be considered fiction when there’s no plot? Philosophy, perhaps, or criticism, but not fiction. As this is clearly part of a larger piece we should not be hasty in responding with astonishment to the assumptions packed into this passage. But is her final question meant to lead to an explanation of why In Search of Lost Time is fiction and that here she is playing devil's advocate? Given that she believes Proust is "at base an essayist", we can assume the question is rhetorical. Perhaps Shields includes it as a corrective to the others in line with the lack of filtering demanded by his manifesto, or perhaps because throughout Reality Hunger he celebrates the "lyric essayist" and that to believe Proust is “at base an essayist” is not to be blind to the lesson of In Search of Lost Time. Yet Proust's writing career reveals the necessity of the novel's status as fiction. It is more than a label. Had it not been fiction, his first novel Jean Santeuil – a conventional bildungsroman – would have been published, In Search of Lost Time left unwritten and Proust consigned to comparative literary oblivion. So what is at stake when the question of fiction is raised: is it merely a definition of genre? Shields has a surprising and relevant epigraph for his book: "All great works of literature either dissolve a genre or invent one". It is taken from the first page of Walter Benjamin's essay The Image of Proust. Surprising because Benjamin is otherwise glaringly absent from Reality Hunger – his essay The Storyteller is not quoted at all; a perplexing omission – and relevant because this is also true of Proust's great work. But only half-true. Alone it exposes the innocence of entry 182's reading. Except, the sentence in which this line appears is truncated and leaves out (at least in my translation) "It has been rightly said" at the beginning and "that they are, in other words, special cases" at the end. Great works as special cases is an important idea. Each great modern work is a special case because it has been made from bottom up, not bolted onto the frame of genre. There is nothing "at base" from which to build except experience itself: experience of reality and experience of its absence. It is made, that is, from inside the distance between imagination and reality. What is at stake then in specifying that In Search of Lost Time is fiction is awareness that his novel attends closely to the pressure exerted on the space of writing; the double pressure of imagination and reality. Without opposing and supporting pressure, neither reality nor the imagination can have any vital presence in works of art: one is death, the other deathless. By writing imaginative fiction, Proust becomes able to open up his work to what haunts it, the outside, the unknown, reality. In order to do this, he did not need to include chunks of undigested reality into the work. 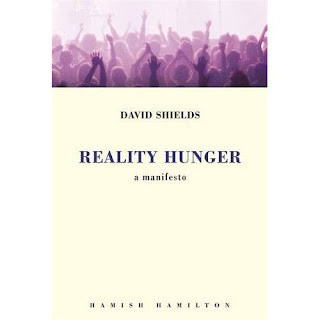 Perhaps Reality Hunger can be said to do the same in its own way given that it includes so much that is not David Shields' own work and so much that contradicts so much else within the work. Yet the restricted content – no inclusion of literary works of philosophy, criticism and genreless fiction consisting of short entries or fragments by writers such as (off the top of my head) Kierkegaard, Cioran, Blanchot, Pound, David Markson, Thomas Bernhard, Jean Paulhan and Félix Fénéon – and the frequent vapidity of the chosen content suggests stunted ambition. Of course, this is a product of its inbuilt unwillingness to develop insights with defensive reason, and there is logic and merit in such a refusal: it lets the work speak for itself. However, such a lack is experienced by the reader as a discharge of authorial responsibility. That is, responsibility toward the destiny of every book; its inevitable submission to unity. This is finally what, for all its local entertainments, betrays Reality Hunger. No matter how many chunks of reality David Shields or anyone includes in a work, it becomes something else: literature takes possession of it.